The countdown to the first home game of the season continues, and this week we are counting down the days with a daily giveaway of great prizes from our sponsors. How many of you have a little Clemson Girl in your life? How fun is it to help her dress up in Clemson adorableness every Saturday during football season? If you answered "Yes!" to both of these questions, then you're going to LOVE today's prize package - a full assortment of Clemson bows and a headband from Katiebug Bows. Can you believe this bow is only $5!?! Katiebug Bows offers super cute hair bows, hair clips, and headbands for girls and their dolls. The Etsy shop is run by a Clemson alum. 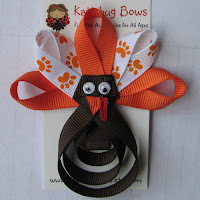 Katiebug Bows is a great way to get handmade hair accessories for your little girls for great prices. The shop makes it super easy to shop online by offering a flat $2 shipping fee - no matter how much you order. Katiebug Bows is also offerring Clemson Girls 20% off of their total purchase by using coupon code CLEMSONGIRL! What a great offer! Today, one lucky Clemson Girl reader can win a prize package featuring a variety of Katiebug Bows Clemson bows and headband. your neck during those hot games. with a bow attached on the side. Deadline for all entries is midnight tonight! We will randomly draw a winner tomorrow, Friday, June 7th and email the winner. The winner will have 48 hours to contact us after we send the email or we will draw a new winner. 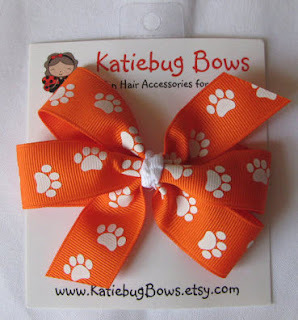 Special thanks to Katiebug Bows for sponsoring such an adorable giveaway and for offering such great discounts to Clemson Girls! Who's excited about football in Death Vally again!?! ?